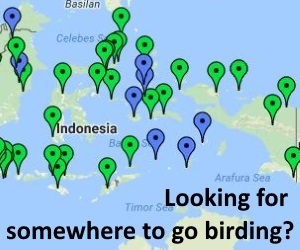 Birdwatching in Sumatra can be very rewarding, with over 600 bird species recorded including around 28 endemics, it can also be very tough at times! Sumatra is big, and the distances involved in moving around can be great. Despite the massive area, however, very few established sites are known and many visitors just go birding at two; typically Way Kambas National Park and Kerinci-Seblat National Park, although the popularity of Bukit Barisan Selatan National Park is on the rise. A trip to just two of these sites can get you almost all of the endemic species and many of the other highly sought after birds. For those with time on the their hands and a thirst for adventure, Sumatra has many, more unexplored or under-explored areas. One such area in particular is the Gunung Leuser region of North Sumatra and Aceh. 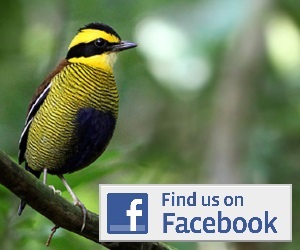 Sumatra also has a chain of endemic bird rich islands off its west coast, including the Mentawi Islands and Enggano. We will be adding information about these sites very soon. Gunung Leuser Vast undisturbed forests stretching from lowlands to montane. Rarely visited and many discoveries still to be made. Kerinci-Seblat Famous montane and hill birding. Easily accessible forests with a good chance of almost all montane Sumatran endemics. Bukit Barisan Selatan Getting a great reputation for montane and sub-montane specialities, also good for lowland and hill birding. Way Kambas Easily accessible lowland forest. White-winged Ducks, Storm's Storks and some of the best night birding in Asia. Coastal Medan Some great sites near Medan for coastal birding. Good for waders, big waterbirds and migrants. Pantai Cemara Not easy to get there, but perhaps the best wader site in Sumatra. Nordman's Greenshank and Asian Dowitcher are regularly seen. bunuadmin on Comments, requests, questions & feedback!